Small gauge metal tubing, which can be found at hobby suppliers, makes an extremely tough and durable aglet. This is ideal if you're particularly hard on your aglets (eg. on football boots or skate shoes). Choose a size of tubing that will fit snugly over the existing aglet (usually 3 to 4 mm). Cut a short piece the same length as your current aglet, using a very fine toothed hacksaw or a power tool like a Dremel with a metal cutting disc. Slip the tubing over the current aglet. Keeping the existing aglet underneath forms a more secure result, plus it's a lot easier than trying to force a thick shoelace into a thin tube! Hammer a small nail into the side of the tubing, then remove it, leaving a small indentation that will hold the tubing in place. For extra security, do this a couple of times. You could also use glue inside the tubing. 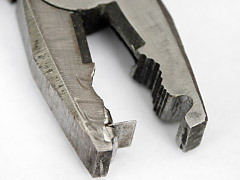 The above method relies on securing the metal aglet over the top of the existing aglet. If you will be shortening the shoelace, one or both of the existing aglets will be cut off, and the nail hole indentations may not provide enough grip to securely hold the aglet onto the shoelace. Instead, the metal tubing can be crimped directly to the shoelace. Slip the metal tubing (brass in this example) over the end of the shoelace; it may help to "twist" it on. If either end still has an existing aglet, it's easier to slip the tubing over that aglet before cutting it off. Crimp the tubing lengthwise, using special crimping pliers or by improvising with a vise, a hammer, and something thin to press into the length of the aglet. NOTE: Some ice skating rinks forbid the use of metal aglets for fear they might fall off onto the ice and become a danger to other skaters. I've built my own custom aglet crimping pliers by grinding a rounded groove into one jaw of an old pair of pliers, then attaching a strong, thin piece of metal (eg. spring steel) to the other jaw, which presses the length of the aglet into the groove. The resulting aglets were very neat yet totally secure. Despite vigorous attempts, I've yet to pull off one of these crimped aglets! I also created this simpler "anvil", consisting of a block of metal (eg. aluminium), a hole drilled through it to fit the metal tubing, a slot cut along the length of the hole, and a strong, thin piece of metal. Secure the "anvil" to a workbench, feed the shoelace + tubing into the hole in the anvil, place the metal "chisel" into the slot and tap gently with a hammer to crimp the tubing. I've found metal tubing in brass, copper and aluminium. Of these, brass is the hardest while aluminium is the softest. Of course, you can also visit a jewellery supplier and buy tubing made of precious metals like silver, gold and even platinum! I've also found "Bootlace Ferrules" (the uninsulated variety) in nickel plated, silver plated and even gold plated. These are normally used in electrical work to finish wires and cables that will be fed into terminal blocks. Their main advantage is that they are already cut to length. Their main disadvantage is that they are difficult to buy in retail quantities (I had to buy a box of 1,000 from an electronics wholesaler). You can also buy crimping pliers specifically for bootlace ferrules, but they are pretty expensive. Metal tubing is generally available in continuous lengths and is often sold in imperial sizes such as 1/8" (3 mm), 5/32" (4 mm) or 3/16" (5 mm). Brass tubing starts out golden, but without a protective coating of lacquer it will tarninsh to a light tan, while copper tubing tarnishes to a reddish brown. Aluminium tubing may dull to a whitish silver, while anodized aluminium tubing is available in a whole range of bright, metallic colors. The best place I've found to buy small-gauge metal tubing is at hobby suppliers. It may also be available at larger hardware stores (again, in the hobby section) as well as art and craft stores. 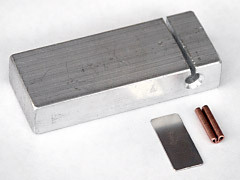 Various techniques for making home-made aglets. Find out more about the tips of shoelaces, which are called "Aglets". This page last updated: 15-Oct-2018. Copyright © 2004-2018 by Ian W. Fieggen. All rights reserved.